This entry was posted in Affinity Mingle Financial Advice, Plus Size online shopping, Plus Size Thrifting and tagged credit card debt by affatshionista. Bookmark the permalink. I was missing the thrifty gene, but I love having it now. And since you also sew you create lots of options in your life. 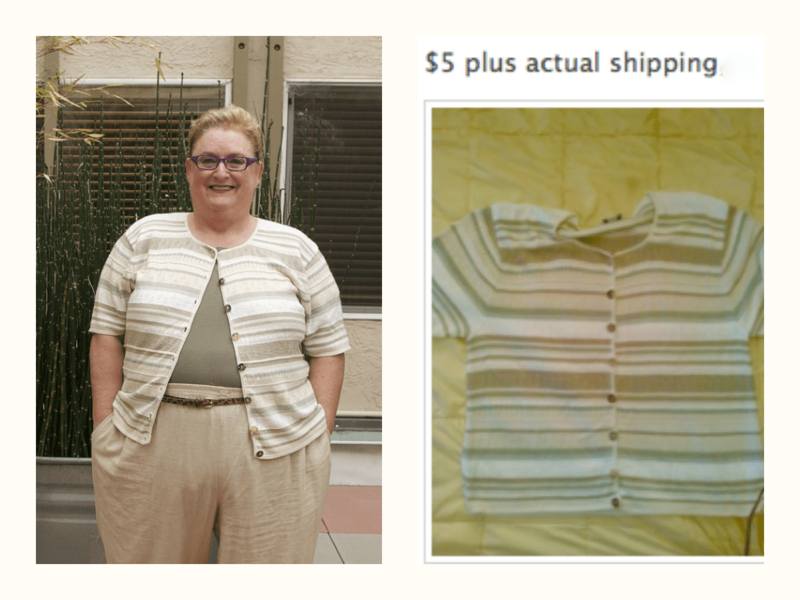 Way to go that’s a great five dollars sweater !!! I find all my great clothes are from recycled places at way lower than retail prices. I love the Hunt you never know what you’re going to find I never pay more than $10 for much from the good will. You, Nancy, are always an inspiration, and always look fabulous. Thanks for being such a great commenter. 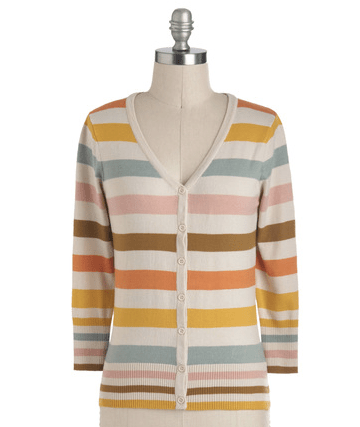 It may not be in the spirit of the post….but I think I have to have the Modcloth Cardi! Of course will use credit card and pay it off when the bill comes. You made me laugh Denise… The Modcloth Cardi is pretty cute, and yes I know you will be paying off that credit card balance. Thanks for reading and commenting. What a FANTASTIC tip! VERY useful. Thanks! Welcome from another “Beyond 50” blogger. Thanks for commenting. My mum & I have always thrifted together. I go to a private university where most girls have everything, and even though I sometimes covet their shiny heels and new Kenneth Cole bags, I never feel uncomfortable around them. I know I can mimic the expensive looks with a few recycled pieces that keep me from splurging. I definitely consider the mileage something will get before I buy it. Heels in blush pink? Wise investment. High-waisted shorts? Negatory. What was I thinking? Thanks Amy, I was raised in Palm Springs, from the wrong side of the tracks, so I know about not having things, but a little perseverance and paying attention can go a long way. Thanks for much for commenting. I love it when we get to hear real stories from real people. love this post, and your blog!!! Thanks so much, you have no idea how happy it makes me when I hear from all of you.